Lovely and unique, our glass terrarium planters are the ideal addition to any home, office, or wedding decor! Create an indoor garden, or add a touch of boho chic to your patio - the decorating possibilities are nearly endless! Each globe features a glass loop for secure hanging, as well as a flattened bottom for sitting pretty as a tabletop centerpiece. Surprise friends, teachers, and loved ones! Our orb planters make the perfect elegant gift for birthdays, Mother's Day, Teacher Appreciation, graduations, anniversaries, Christmas, and more! No foggy business! Enjoy a crystal clear view of your garden everyday! Our terrariums are designed with two small vents to prevent build-up of condensation. Now sold in convenient sets of two, each terrarium measures approximately 6.5-inches tall [including ring] and 5-inches wide. Circumference: 14-inches, plus a 3-inch front opening. Shop with confidence. Shop Cornucopia Brands. 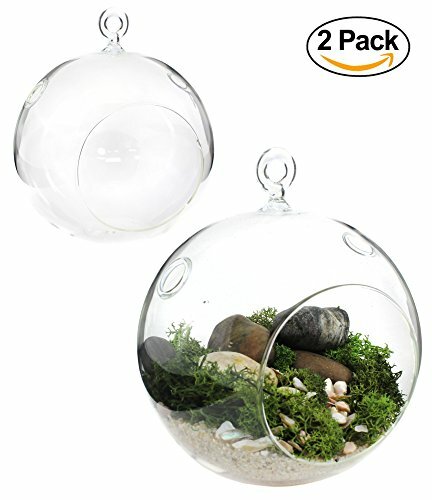 ✓ SOPHISTICATED INDOOR GARDEN OR PATIO DECOR - Add a whimsical touch to any decor with our glass terrarium orbs! Use as small single planters or cluster together for a boho chic effect. ✓ NO FOGGY BUSINESS! - Each globe features two small vents to prevent foggy build-up of condensation. Enjoy a crystal clear view of your garden! ✓ USE AS HANGING DECOR OR TABLETOP CENTERPIECES - The decorating possibilities are endless! Our terrariums are designed with a glass loop for secure hanging, and also a flattened bottom for sitting pretty! ✓ ELEGANT GIFTS & WEDDING DECOR - Create your own unique garden and surprise a teacher, friend, or loved one! Our glass terrariums make excellent gift items and wedding decor and favors! ✓ GENEROUSLY SIZED - Sold in a convenient set of two, each glass orb planter measures approximately 6.5-inches tall [with hanging ring] and 5-inches wide. Circumference: 14-inches, plus a 3-inch front opening.